In the geography lessons in our ‘bachpan’ we learnt that the central India was a plateau. In exams it was generally followed by a definition of plateau. Till this weekend, it was only a picture of plateau that I had in mind. Some 15 years later, on the trip to Mahabaleshwar, I saw it for real! The place was magnificent. Hills plus water form a deadly combo and it was on display in plenty. The rivers originated and meandered at a leisure pace through the flattened hills, providing abundant photo ops. Another highlight of the place was Strawberry. 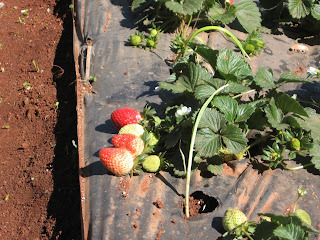 There were numerous farms growing the red fruit. There were different utilizations – in jams, ice creams etc. But the favorite was strawberry cream. It is tough to resist despite being relatively high priced. Needless to say, we had more than one. Along with geography we also had history lessons. A visit to Pratapgarh fort highlighted the violent, brave and strategic history of the place. Guess modern architectures have plenty to learn from the old forts of India. Also, MBA’s can learn a lot of strategy from the history. I wonder how the meetings took place at those times. I am sure concepts of Team work at those times would have good theories which could be used in the modern era. 1 thing that I sorely missed was Para gliding. It was first on my To-Do List on the visit. But unfortunately we went during off season and the para gliding was off. So have to wait for it.!! 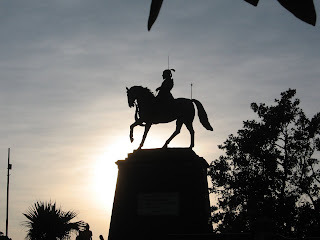 wow.. u reminded me of my days in Pune when mahabaleshwar and 100 other forts/places I visited. Did u try frankie - if im getting it correct - made of corn. And u know what - we went with some frnds who were from west and south India. It was a foggy day and they cudnt believe its fog and they argued it to be smoke until they confirmed it with lcal people :). Ahh I miss that greenery and those forts. There is so much to explore yet..
Oh yes, the forts are really a marvel, which you have to witness in person to understand. If you like the architecture side, check out Raigad, Sindhudurg and Janjeera. They have enough surprises and beautiful places to keep you coming back for more. Forts are amazing, but once you have visited couple of them u find that they are more-or-less same. and the place was not very green when I went... may be you went during rainy season.. this time most places wore the brown color..
@amey: ya forts are always exciting.. it is intriguing to know the fundas/ideas behind the architecture. though the guide this time was a disappointment..
Wow ! Now I want to go there one more time !! Been once in summer and once during rains. Both the experiences were quite different. Though there we get strawberries all the time but we never got to see like in your photo. :( The fields were all covered with those black plastic sheets.